Did you know that working more than 40 hours a week actually diminishes your productivity? And not just in the short term, but for the long haul too! For years, mankind has adhered to the ‘work hard’ principle for living life. The longer hours you work, the more accomplished you feel. The more physical efforts you take, the more you convince yourself of having done an honest day’s work. But why? Because that’s the norm, and it has been for thousands of years. However, the time has come to break this norm. Move over hard working, because smart working is here! Smart working is quickly becoming the new ‘it’ thing, trying to nudge the 9-5 grind out of the picture. And it comes with a ton of benefits to boot. 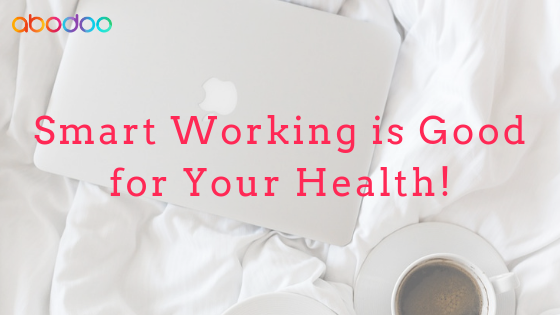 This blog post talks about one of the most important social benefits of smart working – health. How, you ask? Because it literally saves you tonnes of time, and hence your sanity, on a daily commute. You can make your own hours, which means you can work at your most productive or optimum state of mind. There’s no need to go for store-bought lunches as you can cook a wholesome, healthy and hot meal for yourself and even your family. Besides working, you can get the groceries, take a nap, do the housework and tons of other stuff as well. And how does this add up to good health? You are happier! Time becomes more qualitative than quantitative. It isn’t just about crunching numbers, but actually getting quality work done and then some! Plus, you have the time and energy to spend time with loved ones, pursue a hobby, relax and rejuvenate, and improve the quality of your day. And most of all, you have peace of mind. Always remember – Healthy mind, healthy body. To read more about how smart working is good for your health, here’s a link to our smart working health benefits. If you have any other tips or stories you’d like to share with us and our audiences, drop us a note, we’d love to hear from you!